SWPT.org© is the fastest growing and the more active Lifestyle Swingers Dating Site on the Iberian Peninsula. SWPT.org© certifies that all members are adults and for real. Members create their personal profiles with featuring photos and videos. 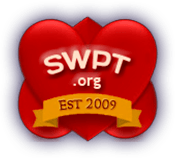 SWPT.org© provides private chat, forums, blogs, speed dating, bulletin board, event notification, private parties, sexshop and much more. We herewith kindly invite you to become a full-featured member of our community.